30 miles on the Rodwell yesterday – one of my regular routes, climb up the hill through Radcliffe, Affetside to Crowthorn then up the track past the Maggot Farm, through the military firing range to Holcombe Hill then down to Ramsbottom. Then blast along the road back home, late as usual. 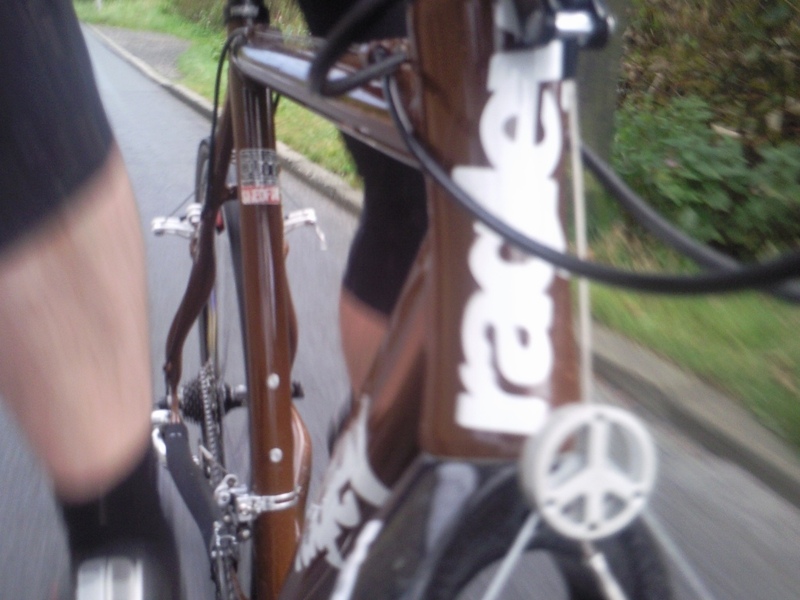 It’s the first proper ride on the Rodwell since the 3 Peaks. During that race I didn’t really have the time to think about how good (or bad) the bike rides, how it felt on my shoulder, what it looked like…I just had to give it a thrashing. It was good then that a few things occurred to me yesterday at various points during the ride. First of all, it feels very light. My Planet X has got disc brakes and MTB hubs, so there’s a weight penalty there. The Rodwell is at least a couple of pounds lighter than the Planet X and that becomes obvious when climbing and also when shouldering the bike. The Froggleg brakes are nowhere near as good as the Avid discs, especially when they’re wet, but I can (just about) cope with that. The shape of the top tube is extremely shoulder-friendly. I’ve got an old shoulder injury after a car accident several years ago so if something carried on it isn’t comfortable I get punished. I can carry this bike on my shoulder for hours I reckon – the flat and wider shape of the top tube, near to the junction of the down tube is really well thought-out. The horizontal top tube makes it easier to get on your shoulder quickly whilst moving. I wasn’t expecting a horizontal top tube to make much difference, but it does. It’s definitely easier to get on the shoulder whilst running towards an obstacle and I have to assume it’s because there’s more room to do so. 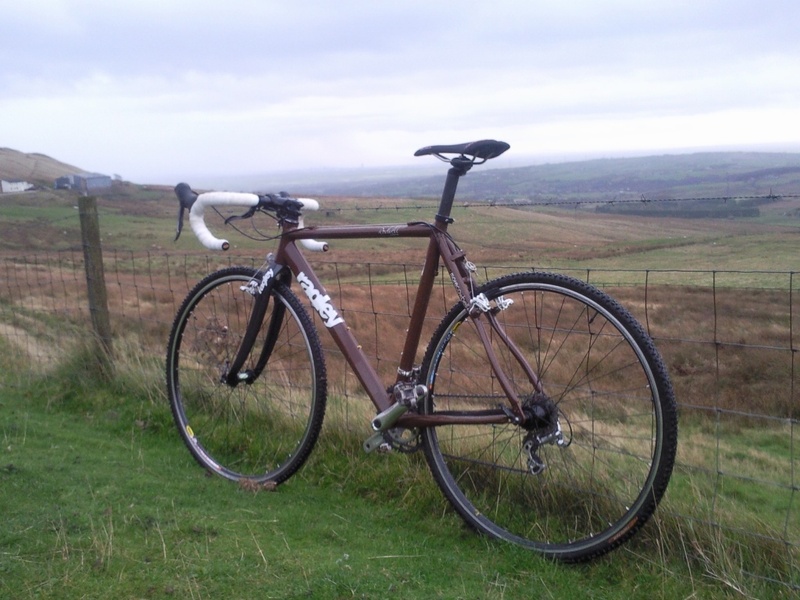 It’s comfortable to ride – apparently alloy frames are supposed to be harsh and unforgiving… this one isn’t. Perhaps that’s more a combination of tyres/wheels as well as the compliance of the frame, but there’s none of the smashing over rocks and bad roads that I had with the PX. Next weekend I’m going to have a go at racing on this bike again, hopefully not ill this time. 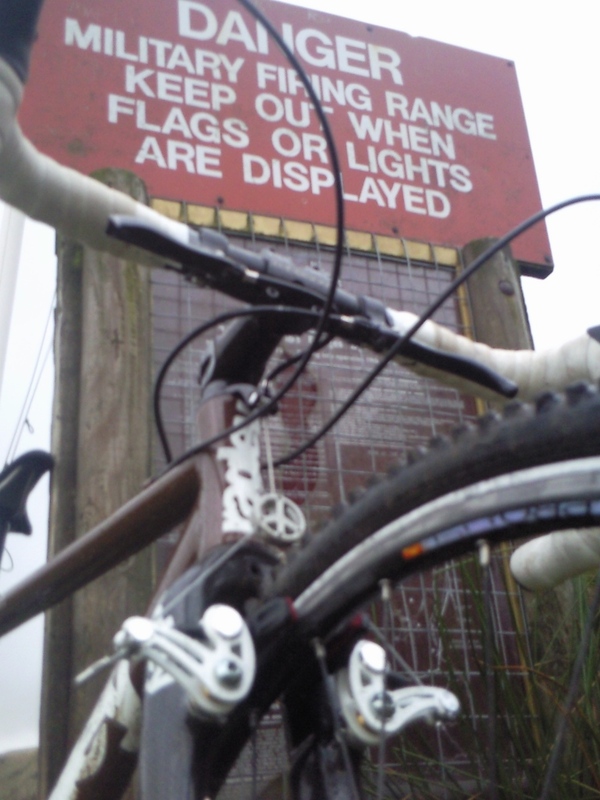 I thought I’d try to be a smartarse and juxtapose the brake hanger with the ‘beware of bombs and shells and guns’ sign.